Rothbard's most famous monetary essay has influenced two generations of economists, investors, and business professionals. After presenting the basics of money and banking theory, the author traces the decline of the dollar from the 18th century to the present, and provides lucid critiques of central banking, New Deal monetary policy, Nixonian fiat money, and fixed exchange rates. He also provides a blueprint for a return to a 100 percent reserve gold standard. In the information age, money has mainly become information, electronically stored and transmitted. The authors propose a simple reform of monetary policies, and spell out its practicalities step-by-step. The arguments for it are very strong. 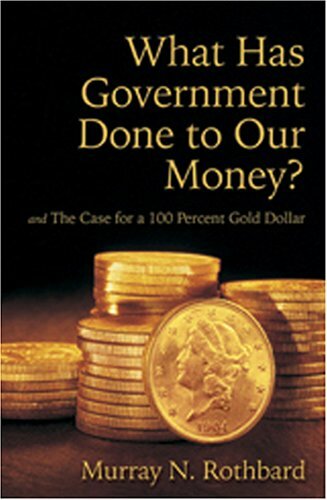 The book covers the history of gold in the US, explains that its breakdown was caused by governments, and explains the merit of having sound money: prices reflect market realities, government stays in check, and the people retain their freedom.